This is the second in a two-part series on the serious threat of fire caused by arc faults in the electrical systems of commercial, industrial, and residential buildings. In my first post we looked at the kinds of conditions that can cause arc faults, including bad connections, and damaged cables. As mentioned, arc faults often go undetected by protection devices like circuit breakers and residual current devices (RCD). In this post, I’ll talk about the emergence of arc fault detection devices (AFDD) that are helping address this hidden threat. But first, let’s look at what’s driven the development of this new technology. Why the need for AFDDs? First and foremost is the fact that faulty electrical systems continue to pose a serious threat of fire risks to buildings and their occupants. Worldwide, electrical system mishaps are the cause of 25% of all fires – with 80% of building fires occur in dwellings. These fires take an awful toll. For example, from 2011 to 2012, there were nearly 300 fatalities and over 11,000 injuries in the UK due to fires in dwellings. These and similar statistics from around the globe have heightened concern by governments and safety authorities. It has also spurred the establishment of the AFDD product standard IEC 62606 “General requirements for arc fault detection devices”, followed by a recent amendment of the installation standard IEC 60364-4-42 in 2014 for countries applying IEC standards (Europe and other parts of the world). The standard recommends installation of AFDDs in residential and commercial buildings where there are: sleeping accommodations, high quantities of flammable materials, combustible construction materials, fire propagating structures (e.g. high-rise buildings), and irreplaceable goods (e.g. museums). The other fact that has spurred the demand for AFDDs is that advances in miniaturization and digitization have made it possible to design intelligent arc fault detection capability into a very small, affordable, and highly reliable package. New AFDD designs are comparable in size to miniature circuit breakers. So how do these devices work? An AFDD performs extensive data analysis in real time, looking for characteristic, persistent deformations of the current and voltage waveforms that indicate a potentially dangerous arc. There’s been a lot of research done regarding the nature of arc faults. The algorithms used by AFDDs increase the accuracy of detection and reduce false alarms. When the AFDD senses a potential arc fault risk, it immediately trips to isolate the faulty circuit. As electrical arcs can degrade ‘in a flash’ and ignite any nearby flammable material, it’s important that AFDDs react very fast before this happens. And they do. Note that an AFDD may also work in conjunction with a circuit breaker or residual-current circuit breaker with overcurrent protection (RCBO), and may also incorporate its own switching function. An AFDD is smart enough to avoid tripping on what is a normal, harmless ‘working’ arc. This could be a light switch being flicked, a wall plug being pulled out, contactors or other types of controls operating, or arcs created by the motors in power tools, vacuum cleaners, etc. To avoid making such an error, the AFDD cross-references many different parameters to positively identify arc fault characteristics. The parameters referenced include the arc current, arc duration, arc irregularity, and varying levels of high frequencies (characteristic of current passing through cable insulation). An AFDD acts as a supplement to the overall safety equation by addressing a safety gap that, up to now, has not been covered by circuit breakers or residual current devices (RCDs). In fact, beyond the IEC recommendations mentioned above, when upgrading switchboards an AFDD should be considered in any situation where there are protruding, outdoor-located, or unprotected cables, as well as aging wiring (with inaccessible connection boxes), shoddy workmanship of original circuits, and circuits in wooden structures. When considering the use of AFDDs, it’s recommended that designers and contractors consult with a trusted partner who is familiar with this technology, can analyze the safety requirements for new construction projects, and properly audit sites to determine deterioration levels for renovation projects. To learn more about this subject, refer to the white paper ‘How Arc Fault Detection Devices Minimize Electrical Fire Threats’. 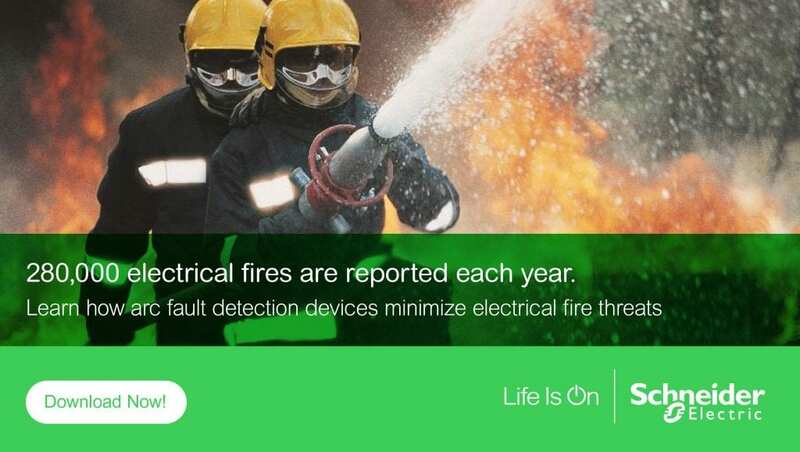 Also make sure to discover all of Schneider Electric’s AFDD solutions.